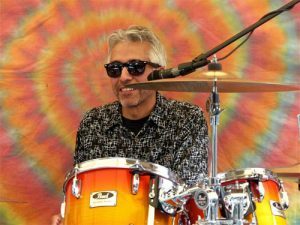 Danny Diaz is well-known within the Kalamazoo music scene and is an experienced and talented drummer. He’s played in some of the area’s top bands and, along with that, he’s the nicest, friendliest person you’ll ever meet. He grew up in Blissfield, Michigan, and moved to Kalamazoo in 1976. Danny’s favorite drummers are Bill Bruford (Yes, King Crimson, Genesis), Steve Gadd (session drummer, Paul Simon, Steely Dan, Joe Cocker, Eric Clapton & more), Don Brewer (Terry Knight & the Pack, Grand Funk Railroad), Phil Collins (Genesis, Eric Clapton, Robert Plant & more), Peter Erskine (Steely Dan, Weather Report). Danny has played with two local “Tex-Mex” bands – The Rincones Band from Grand Rapids and Los Bandits from Kalamazoo. He’s also played with two blues bands from the area – Blue Moon and Unleashed, and with the Aurora Band (classic rock), Crash Dummies (heavy metal), and Pound & Beers (original music). He’s played shows at the State Theater (Kalamazoo’s biggest venue) with Los Bandits, Blue Moon, and Pound & Beers. He’s also an experienced session drummer and has played on many CD projects with Los Bandits, Blue Moon, Greg Orr, Rene Meave, Susan Harrison, Andy Baker, Pamela Chappell, Pound & Beers, and Joe Ferguson. Danny Diaz has received the Kalamazoo Gazette Stoker Award and the Midwest Tejano Music Award with Los Bandits.